I recently got interested in second order autoregressive processes ("AR(2)" processes), after spending quite some time working only with first order ones... It was time to get an extra degree of freedom/complexity ! However, I didn't have much intuition about the behavior of these models and neither about how to "tune the knobs" that set this behavior so I spent some time on this subject. with the real numbers a1 and a2 being the two parameters that tune the "behavior" of the process. may be call the "input" in the context of linear filters, while "innovation" (i.e. a white noise input) would better fit in the context of random processes. A nice property of AR(2) processes, as opposed to AR(1) is their ability to capture slowly oscillating behaviors, like ocean waves. Also, within the AR(2) model, AR(1) is included as the special case a2 = 0. In order to understand the interplay of the two parameters a1 and a2, I spent extensive time doing paper-based analytical/theoretical studies. I also created a IPython Notebook which I should publish when there is proper Notebook -> HTML conversion system (edit: now available on nbviewer). Most of the AR(2) behavior is governed by the characteristic polynomial . This polynomial helps in showing that there are two regimes : the one with two real roots (when ) and the one with two complex-conjugate roots (when ) where I can get my long-awaited slow oscillations. A third regime is the special case of a double root which I don't think is of a special interest. Beyond the study of the root, I also computed the variance of the process and its spectral density. I found both not so easy to compute ! the root locus diagram, where one can see the transition between the two real roots and the two complex-conjugate roots as the boundary is crossed. the Impulse Response (output of the filter for a discrete impulse ), implemented simply using scipy.signal.lfilter. the Frequency Response, which I normalized using the variance of the process so that it always has unit integral. This latter property is mainly based on my own analytical derivations so that it should not be taken as a gold reference ! Overall, I felt pretty at ease with the event handling machinery of Matplotlib. I feel that writing an interactive plot didn't add too many heavy lines of code compared to a regular static plot. Also, the learning curve was very smooth, since I didn't have to learn a new plotting syntax, as opposed to some of my older attempts at dynamic plotting with Traits and Chaco. Still, I feel that if I wanted to add several parameters in a small interactive GUI, Traits would be the way to go because I haven't seen a nice library of predefined widgets in Matplotlib (it's not it's purpose anyway). So I keep the Traits and Chaco packages for future iterations ! As for the capture of oscillations, the real root of AR characteristic polynomial contribute to the autocorrelation function that has a exponential decaying shape (linear signal), and the complex root gave a exponentially damped oscillation. So I guess, while the order of AR model is 2 or above, there is the possibility that the characteristic polynomial will have a complex root, and therefore has the ability to describe a wave shaped signal, or say, a signal which has some more frequency content. 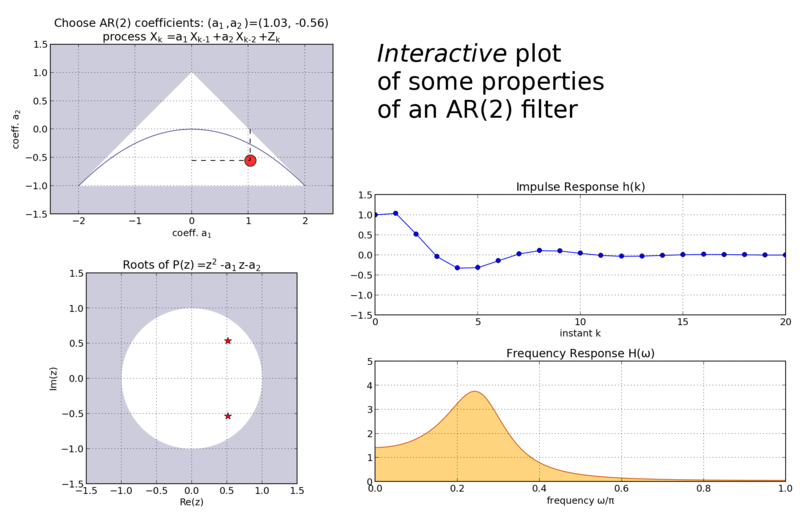 But then, the behavior of 2nd order AR is hard enough to interpret，and I'm working with 4,5 or 8th order AR... kind of frustrated to find some one to one relation for AR coefficients and frequency components. The AR coefficients have of course an influence on the spectral density : there are directly linked. I just found a quick reference on reference.wolfram.com which gives the formula for the spectrum of an ARMA. About the characteristic polynomial, you can indeed see on the plot that the two roots are complex conjugate when the behavior is oscillatory. That's why an order of at least two is required to get oscillations. The physical interpretation of coefficients for a discrete time model is alway difficult, but much better with continuous time models. Also, for higher order models, it is always possible to factorize the polynomials as a product of first or second order terms. As an update, I just put online the IPython Notebook I created to study AR(2) processes. In particular, it contains the formula for the roots of the characteristic polynomial.